D and I have been spending time getting to know our new home and the countryside around it. We live in Nottinghamshire, a county chock-full of history. Robin Hood’s Sherwood Forest is a bare ten minute drive away—what’s left of his forest, anyway. We’re slap bang in the middle of the Dukeries, the part of the county where the great estates of no less than four Dukes all rubbed shoulders. The Dukes of Portland (Welbeck Abbey), Newcastle (Clumber Park), Kingston (Thorsby Hall) and Norfolk (Worksop Manor) all lived cheek by jowl here, and each of their houses is within twenty minutes of us. 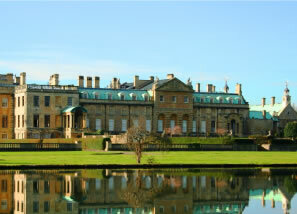 Welbeck Abbey. 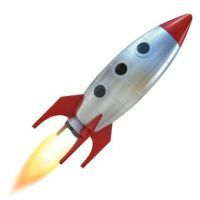 Image licensed under the Creative Commons Attribution-Share Alike 3.0 Unported license. 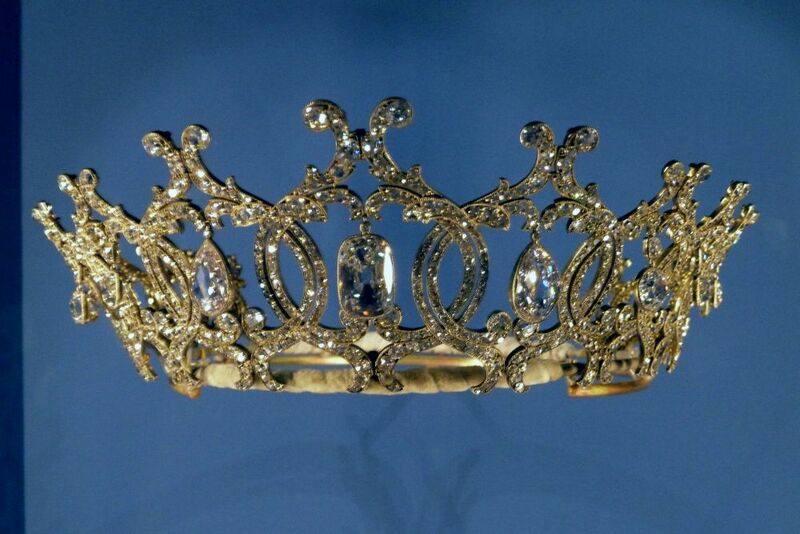 The Portland diamond tiara, by Cartier, c1902. commissioned by the 6th Duke of Portland for his wife, Winifred. The Duke supplied the diamonds hanging in the circles, which had been cut in the 17th Century. More history here: Winifred was one of the canopy bearers for the anointment of Queen Alexandra at the coronation of Edward VII, and wore this tiara. And there’s a charming, amusing story about the Duke waiting for her to finish dressing one evening when they were going out to dine, and sitting on a chair without looking first. He sat on the tiara. Both it, and the Duke’s posterior, were apparently undamaged. See? History no matter which way you turn, and in the smallest objects. It’s a seriously lovely piece. 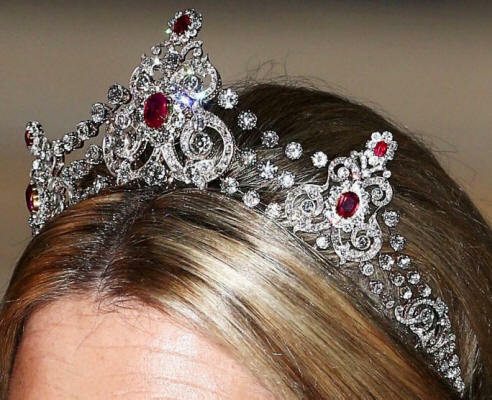 Until you see a diamond tiara in the flesh, so to speak, you can’t really imagine how very sparkly it is. How ooooooooooh shiny! I adore jewellery, you see. The real, criminally-expensive stuff that the French call haute joaillerie; the wonderful pieces by Cartier, or Mellerio, or Boucheron. I hasten to add that I don’t own any of it personally, but when I am very rich I am going to go out and buy myself a tiara. A real one. One by Cartier that I can wear while I’m doing the housework. So when, in The Gilded Scarab, I needed to find a way for Rafe Lancaster to finance the purchase of his coffee house, what better way than for him to find that his that his inheritance from his mother is her jewel box, and far from it having a few gewgaws that might be worth a few hundred guineas, it has some very fine pieces indeed. Very, very fine pieces that he sells for thousands of guineas to the head of his House, The Stravaigor. The drawback is that this puts him an obligation to his House that he will, one day, come to regret. In his mother’s jewel box, Rafe finds a ruby grande parure. The language of jewellery is French, and a parure is a jewellery set: several (or all!) pieces from tiara, necklace, earrings, bracelets, ring, devant de corsage and brooches. The one owned by Elizabeth Lancaster, Rafe’s mother, is particularly fine, with rubies of a true pigeon’s blood red, and made by one of the oldest of the French jewel houses, Mellerio dits Meller. Mellerio has a long history, going back to 1613 when Queen Marie de’ Medici granted special privileges to the Mellerio family permitting them to carry cut crystal, trinkets and other small goods between said town of Paris and elsewhere throughout the kingdom without let or hindrance by any person. From this small beginning, the Mellerio family very soon became jewellers to an illustrious clientele. Almost every royal house in Europe has a bauble or trifle made by Mellerio. Elizabeth’s jewels are modelled on the ruby parure owned by the Dutch royals. 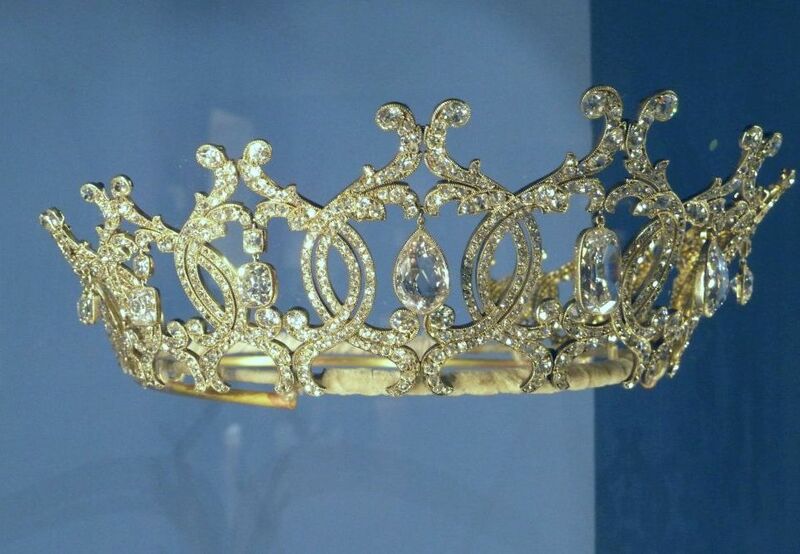 This is the tiara from the parure, which has some very fine rubies indeed. Even in 1899, you’d pay a pretty penny for an item like this. Certainly enough (almost) for Rafe to buy a coffee house in central Londinium, just beside the Britannic Museum. But more importantly, although Rafe doesn’t know it yet , the jewellery has a significance he can’t even begin to guess at. As Rafe himself says, when he sees the parure for the first time: How on earth had my mother acquired these jewels? I’d expected one or two good pieces—she had been the wife of a wealthy country squire, after all. But the jewelry was far more than I’d anticipated, far more befitting someone in a much higher social position. I’d have given my pension to know where it had come from. I have been waiting, what seems like years for this book! Lol. It’s great to hear from you. Not only that my family have connections with Nottinghamshire. My parents came from Nottingham and although I was born in Loughborough, my family and I used to go to Sherwood Forest a lot. So reading all that was great. It was also fun reading about the new book you’ve got coming out, The Dog Who Swallows Millions. I was so enthralled by The Gilded Scarab that I am so excited to hear Rafe’s story go on. It’s a lovely part of the country. D and I are very happy here – we love exploring new areas and keep finding gems of little villages around here. Sadly, we bought a house in possibly the plainest village in north Notts! But the house itself is gorgeous. I’m about 20k into Dog, so hopefully it will be out (if DSP want it) sometime this year or early next. I’m glad you like Gilded Scarab – I confess I’m a little bit in love with Rafe myself.